My living on the Spectrum includes hearing some things more loudly, tasting some things differently, smelling some things more strongly, and feeling some things more strongly. It was supposed to be an ordinary afternoon assignment subbing for a teacher’s aide in a special education pre-school class. It turned into an unordinary day with a few sentences. It is easy to remember the date because it was Friday, the 13th. I’m not superstitious or anything, but that Friday, the 13th, will go down as memorable because I spent the afternoon in meltdown country while trying to pretend I wasn’t in one. While I was watching three of the seven students in the play section, I was told to put something away. I wasn’t yelled at, but it took me back in my mind to 1st grade when the teacher had me stand in a corner. I imagine to a neurotypical, it would have been no big deal. Something that fell off one’s back. 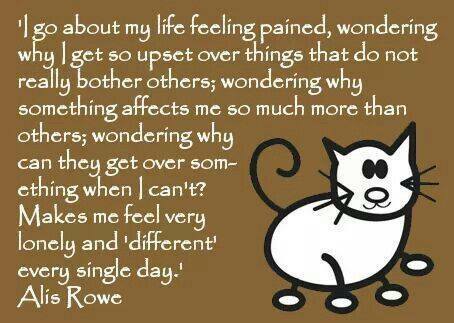 I so wish it could have been that way for me, but living on the Spectrum includes feeling things strongly. I felt a thrust of panic shoot through me landing in the pit of my stomach. I can’t begin to guess how many times I’ve lived through similar experiences and it’s just as painful as it was when I was a child. I immediately responded in a socially acceptable way without showing any sign of my panic button going off. I didn’t want anyone to know I was falling in meltdown country. I had a job to do and had to keep what was going on in my inner being a secret somehow. Shortly thereafter, I was assigned to assist one of the students who was severely autistic. Try to imagine this picture: A 58-year-old woman with autism trying to calm down a 5-year-old child with autism while she is fighting back tears as she is melting down inside. It is sort of like the blind helping the blind. The thinking part of my brain was telling me, “All you need to do from now on is… It is no big deal, stop thinking about it, etc.” That was logic talking and there’s nothing logical about my hypersensitivity. There were no shortcuts. I had to weather through all the stages of fear, shame, guilt, and anger before I would ever feel any peace about it. Then, it came time for gym class. The activity was video dances and the lights were out while the kids danced. Thanks to the lights being out, I was relieved of having to fight back the tears. I let them stream down my face. I wanted so much to retreat to a corner, rock myself silly, and cry my heart out. One thing that replayed over in my mind was the school day would end and I could make my escape back to my safe place at home. I had been looking forward to the weekend but I knew a cloud would hang over it by reliving the afternoon episode of my Friday, the 13th. I didn’t lose my sense of humor. No meltdown has ever taken that; at least, not yet. I chuckled at my thought that come the next Friday the 13th, I should spend it in hibernation. I’m one of those on the Spectrum who takes a long time to get over even a small slight. I predict I will have a conversation a decade from now if I should live so long in the shower about what I might have done or said differently on that Friday the 13th. There’s an old saying that there’s always a critic out there somewhere. I am reminded of that every time when I log in to my Facebook or Twitter account. Imagine if you can that everyone on the Internet superhighway were to strictly adhere to the rule “if you can’t say something nice about someone, don’t say anything at all”, for just one day. My guess is the Internet traffic would be reduced to the volume of highway traffic on a Christmas morning. Now I am not anti-social media. I am an avid user myself of social media. There are the positives of contact with extended family and friends I wouldn’t have contact with otherwise. Like any number of things, social media is a two-edged sword. I have to take the sour with the sweet when I log in to my accounts. I enjoy the sweetness of the baby picture of my first cousin’s grandchild while ignoring the postings of those who never have anything nice to say about anything. I wonder if social media had been around when Jesus walked this Earth, how many postings there would have been of Him. My guess is Jesus would have been a popular topic in His time. After all, multitudes of people flocked to see Jesus because they had heard of Him through word of mouth. Jesus gained so much popularity that His critics, such as teachers of the law and Pharisees, feared a rebellion and sought a way to turn the crowds away from Him. One of the things Jesus’s critics threw at Him was performing miracles of healing on the Sabbath. Instead of being happy for those who were healed, the critics were crying foul claiming it was unlawful to heal on the Sabbath. Jesus paid them no mind. A number of miracles recorded in the scripture were performed by Jesus on the Sabbath. One of them is told in Luke 6:6-11. Jesus entered into a synagogue and among the crowd, there was a man whose right hand was withered. The scribes and Pharisees were watching every move Jesus made, wondering whether He would heal on the Sabbath. They had no concern for the man with a withered hand. They only hoped Jesus would heal this man so they could seize the moment and criticize Him. In their way of thinking, the Sabbath was a day of rest and they considered healing folks of their infirmities a violation of that rule. Jesus knew they were watching Him and beat them to the punch. He had the man with the withered hand to stand up in the crowd. Then Jesus spoke to the crowd asking if it was lawful on the Sabbath to do good or evil; to save a life or destroy it. No one said a word. Total silence. Jesus’s critics were caught in a corner. They’d be in trouble if they had said evil. How could they say good knowing they couldn’t then very well criticize Jesus for then doing the good of healing someone? Since they were silent, Jesus said unto the man to stretch out his hand. When the man did, his hand was restored whole as the other hand. Jesus once again had silenced his critics with words alone. Rising above criticism can be a lonely road when it is hard to find a supporter. But if you are doing what the Lord has laid on your heart to do, I can’t think of a better reason to do anything. For example, it had to have been lonely at times when Noah was building the ark before the flood came. I take another lesson from this story which is to not only rise above criticism, but to reign in my own. I should be prayerful of what to say and what not to. I’m not God and so I can’t claim to know what’s best for someone else, let alone myself. I should prayerfully aim to be more in the cheering section than in the critic’s corner.